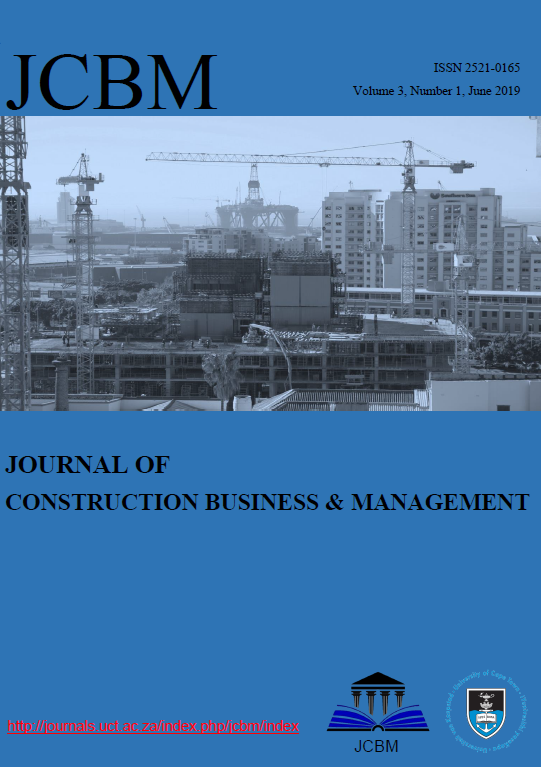 Welcome to the fifth issue of the Journal of Construction Business and Management. The experience of construction industry stakeholders and businesses in the dynamic global economic environment needs investigation towards equipping companies and stakeholders with strategies for navigating the challenges encountered. The topics covered in this issue are related to construction business management, organisational commitment, cost planning, sustainability and practices used in the procurement of construction projects. The issue contains six articles that were written by thirteen scholars based in Nigeria, South Africa and Zambia. The articles provide robust narratives relating to recent advances in construction business and management research. The conclusions reached in the paper are stimulating. The first paper by Oluwatayo, Amole and Alagbe identified attributes in the profile, structure and strategies of architectural firms, which are associated with the success of these firms. They found that factors which were related to the success of these firms. They found that factors which were related to the success of the Architectural firms include the availability of information technology and the levels of specialisation of duties. They posit that architectural firms use IT facilities strategically in enhancing business performance. Paper two by Aghimien, Awodele and Maipompo noted the shortage of skilled construction workers in the industry and how ensuring the commitment of the few available workers to their organisation objectives is essential. Using a survey design of construction company workers to assess their level of organisation commitment, the study found that the typical type of commitment exhibited by skilled construction workers is the continuance commitment. Aghimien et al. advance that construction companies need to continually improve in the aspects of human resource management to attain better commitment of their workers and at the same time improve their productivity. The paper by Ogunbayo investigated risk factors in timing development, minimisation of cost and expected a return as they influence the successful delivery of residential property development. Ogunbayo established that real estate developers were more concerned with the influence of economic and technological risks than other sources of risk. Paper four by Mwanaumo and Mambwe examined management strategies that impact organisational safety culture in the electricity industry in Zambia. The rationale for their investigation was based on their assumption that entrenching safety cultural aspects is one of the functional areas within management systems that underlie various strategies. They reviewed various literature on management strategies and employed a structured questionnaire in obtaining the required information. The study by Mwanaumo and Mambwe concluded that management commitment and their involvement in the safety aspects of the electricity industry is not just a benevolent obligation, but it compels and motivates workers they protect to achieve organisational objectives and goals. The article by Aiyetan identifies the influencing factors of management practices and quality of management during construction that impact on project delivery time. The study employed a quantitative research approach in obtaining the necessary information that answers the research objectives. The study found that the management style and the quality of management used on construction projects are poor and suggested ways through which this reduced level of performance can be improved. Lastly, the paper by Oladiran, Ogunsanmi and Dada suggested a novel approach to solving the incidence of building material waste on sites through developing a framework of the issues and processes that are involved in its minimisation. Oladiran et al. conducted a survey to validate the proposed framework for material waste minimisation. They recommended that the proposed framework that was developed should be adopted by construction stakeholders to prevent and minimise material waste at all stages of development of building projects. Finally, I wish to acknowledge all authors who submitted papers for consideration, members of the JCBM Editorial Board and panel of reviewers for their support, timeous review and comments that have helped in defining and improving the quality of manuscripts published by the journal. We welcome feedback and suggestions from readers towards improving the quality of the journal and in maintaining the integrity of the findings published. WINDAPO, Abimbola. Editorial. Journal of Construction Business and Management, [S.l. ], v. 3, n. 1, feb. 2019. ISSN 2521-0165. Available at: <https://journals.uct.ac.za/index.php/jcbm/article/view/721>. Date accessed: 26 apr. 2019.